Is Pinot Noir emerging at British Columbia’s signature wine? An increasing number of wineries and consumers would say yes. It is a longstanding debate whether a signature wine is even possible in a region like British Columbia, which grows well over 100 grape varietals for wine. Previously, I was not convinced there would ever by a signature wine, given how complicated the terroir of the Okanagan is – never mind the other appellations. It is a terroir that allows producers to grow world-class Riesling, superb Syrah, distinctive Merlot, complex Meritage blends and ever-popular Pinot Gris. But it is hard to ignore that Pinot Noir succeeds in most BC terroirs, even in the vineyards of Oliver and Osoyoos. Those vineyards are generally too hot for Pinot Noir but good viticulturists seem to have even that under control. No kidding! That seems enough for a signature variety to me. Those producers are getting the word out. In June, a group of Cowichan Valley wineries came together at Averill Creek Vineyards for the first Cowichan Valley Pinot Noir Festival. The quality of the wines was high. On August 19, the third annual BC Pinot Noir Celebration takes place at Linden Gardens in Kaleden. This year, 48 wineries applied to take part. The adjudicators chose the 32 they considered the best. Making those choices would have been daunting. I estimate that I have tasted a minimum of 50 different BC Pinot Noirs since Christmas, when we enjoyed a Foxtrot 2014 Pinot Noir with our dinner. Foxtrot, of course, is a legendary Pinot Noir producer. The first vintage was 2004. In a very short time, the wines had acquired almost a cult following, joining Blue Mountain Vineyards and Quails’ Gate Estate Winery as early leaders in B.C. Pinot Noir. Because Foxtrot encompasses the recent history of the rise of BC Pinot Noir, here is an excerpt from my recent book, Icon: Flagship Wines from British Columbia’s Best Wineries. Foxtrot Vineyards’ proprietor Torsten Allander was apprehensive when a friend he was dining with in 2015 produced a 1999 Kettle Valley Pinot Noir made with Foxtrot Vineyards grapes. He expected a wine that old would be over the hill. “They cracked it and it was fantastic,” recounts Torsten’s son, Gustav. “It was not past its peak.” This confirms the age-worthiness of the legendary Burgundy-style wines that the Allander family, including Kicki, Torsten’s wife, began producing in 2004 from this Naramata Bench property. The 1.4-hectare (3.5-acre) vineyard was planted in 1994 and 1995 by Don and Carol Munro, academics from Vancouver who had retired to the Okanagan. They chose just Clone 115 Pinot Noir, one of the best all-around clones. The vineyard got its name when a bear ambled among the vines in a manner that recalled the foxtrot. “The entire vineyard is own-rooted,” Gustav said in 2015. “I think that is good. The vines are now 20 years old. We have not seen any struggle.” The Allander family, which bought the vineyard in 2002, has since doubled its size by planting an adjacent property. Most of the vines are cuttings from the original Clone 115 plants, and all are self-rooted. New to viticulture, Torsten, who is a retired pulp and paper engineer, sold the grapes for several years. In the 2004 vintage, he started a winemaking trial at the nearby Lake Breeze winery. He wanted to determine whether a world-class Pinot Noir could be produced on the Naramata Bench if one applied the resources (including premium French oak and a state-of-the-art press) to his fruit. When the answer was yes, Torsten built his own cellar in 2008 on the Foxtrot property. Gustav, who was studying engineering in Sweden when his parents bought the vineyard, returned home to become the winemaker. He was mentored by his wife, Nadine, a New Zealand–trained winemaker. The wine is aged 18 to 20 months in barrel, two to four months longer than most Okanagan Pinot Noirs. “We are exclusively using François Frères barrels,” Gustav says. “We have worked with them since day one. It is one of the cooperages of choice for top Pinot Noir producers around the world.” Until 2012, the wine was aged entirely in new barrels. Gustav now ages 40 percent of each vintage in second-fill barrels, moderating the oak to better reveal the fruit flavours. Foxtrot is tightly focused. Intending to cap production at 3,000 cases a year, the winery makes vineyard-designated Pinot Noir from the Foxtrot vineyard. 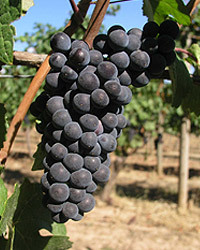 Waltz Pinot Noir is made from purchased grapes or from the fruit of young vines. The portfolio is rounded out with Chardonnay and Pinot Noir rosé. Needless to say, Foxtrot will be one of the wineries participating in the Pinot Noir festival.